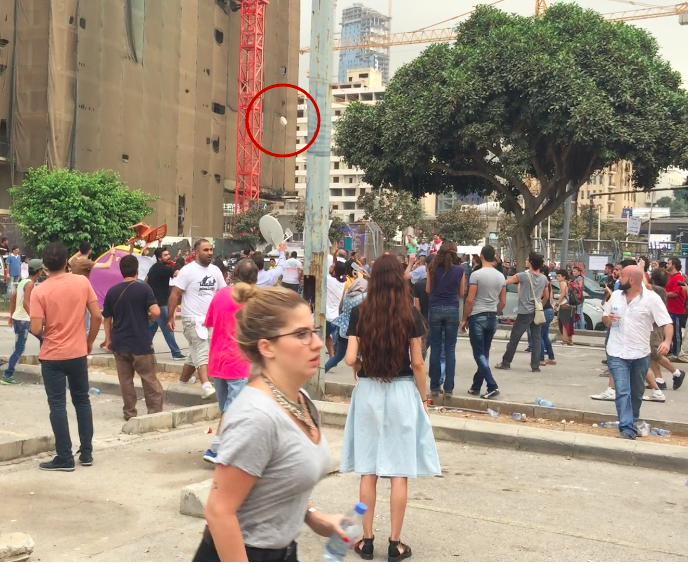 Home Tags Posts tagged with "Amal"
Who has been attacking protestors in Beirut? “You are filming!? Stop filming you punk,” another of the men roared toward the end of the clip below, his eyes overcome with rage as he thrust his finger toward a cameraman. Moments later chairs and tables began flying toward the crowd, as the men ruthlessly punched and kicked everyone in sight. Women are screaming, one falls to the ground. Others begin running and ducking. 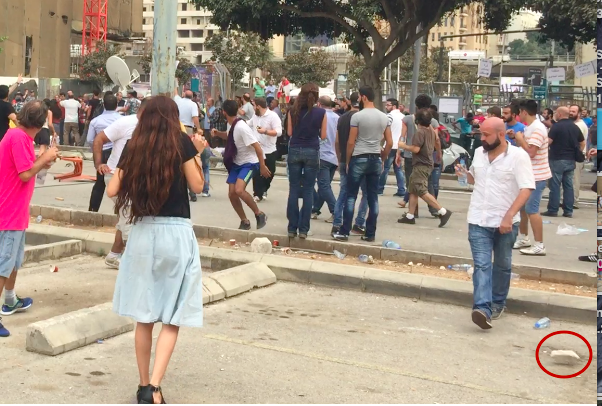 “They called us animals and whores,” one young woman complains, as she runs for cover. Then projectiles began raining down. 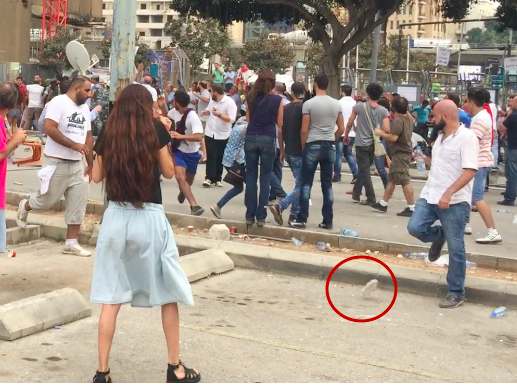 At first they were small rocks and bottles but then large pieces of concrete came twirling through the sky, launched indiscriminately at the crowd of peaceful protestors, many of them already on hunger strike. The irony here is that during this wanton violence, dozens of heavily armored riot police were just standing only a few feet away at the entrance of the environment ministry, armed with shields and sticks . At about 1:30, I pan briefly in their direction. And other videos have emerged of the people literally begging the riot police to intervene. Yet only a handful of regular officers are begrudgingly sent over. So who were these men, ready to destroy dozens of people they did not even know? There was about 10 or 15 of them. They were largely middle-aged, clean shaven, button shirts and shiny sneakers. These were not the so-called “infiltrators” the young unruly protestors who broke glass and lit fires downtown, those claimed to be conspirators by many in the ruling class, eager to cast doubt on the movement. Many of those kids were understandably frustrated after police beatings and shootings of previous days and directed their anger toward the security forces, not the fellow protestors. They came from the slums, wearing ratty or cheap clothes and barely in their teens–none that I saw seemed to be over 20. On the other hand, those who attacked the protestors well groomed and dressed and appeared to be in their 30s and 40s if not older. 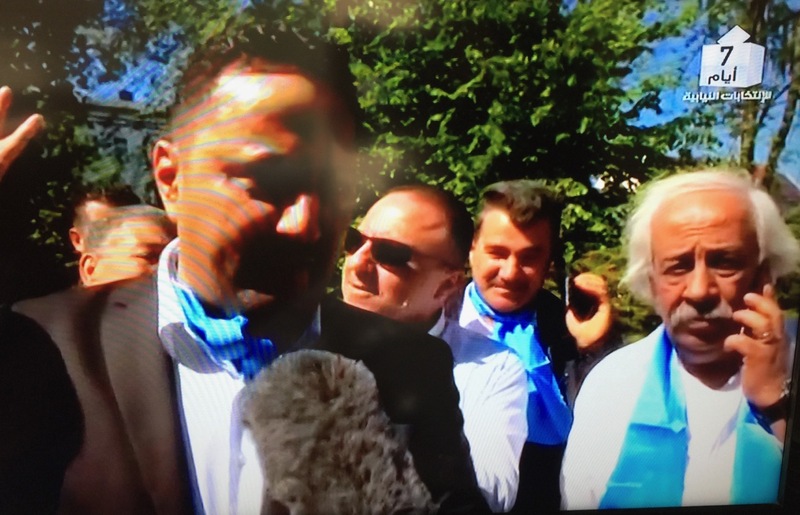 Thus in NBN’s subsequent newscast, this clip is played repeatedly, followed by cherry-picked moments of confrontation between activists and police. 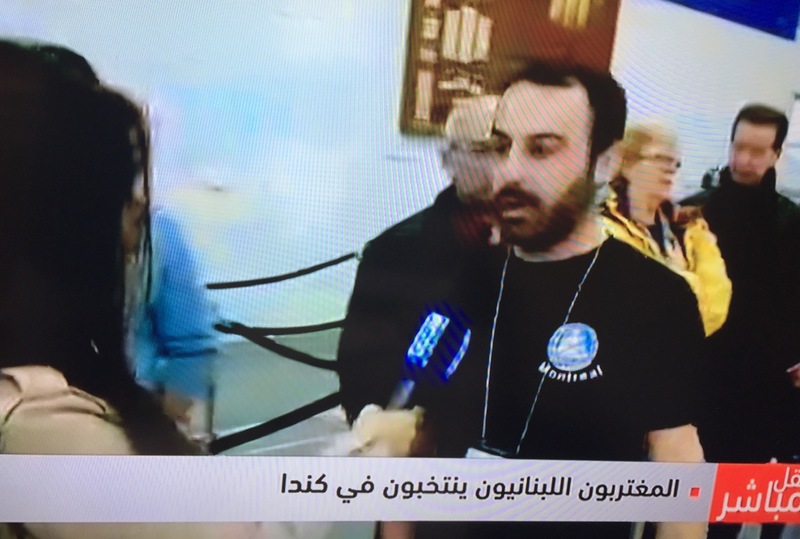 No actual cursing of Speaker Berri is played–only a call for his resignation. 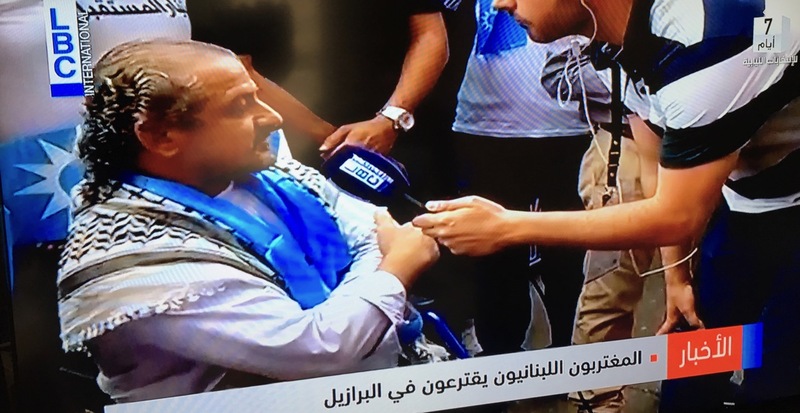 As the images run on screen, the scripts read by reporters and anchors demonize the protestors as uncouth, uncivilized and immoral trouble-makers. 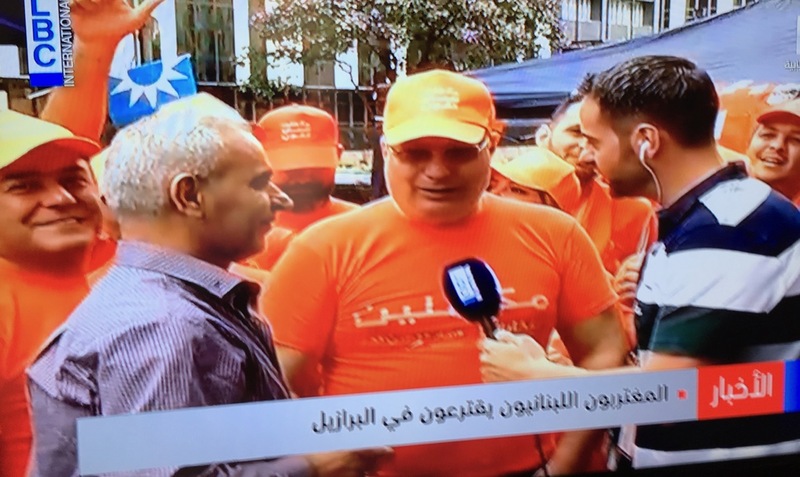 The visibly angry NBN anchor then takes aim at Al Jadeed TV, (one of the few channels that has taken the side of the activists) and basically calls it a propaganda machine churning out hatred and sectarianism headed by a shady businessman. 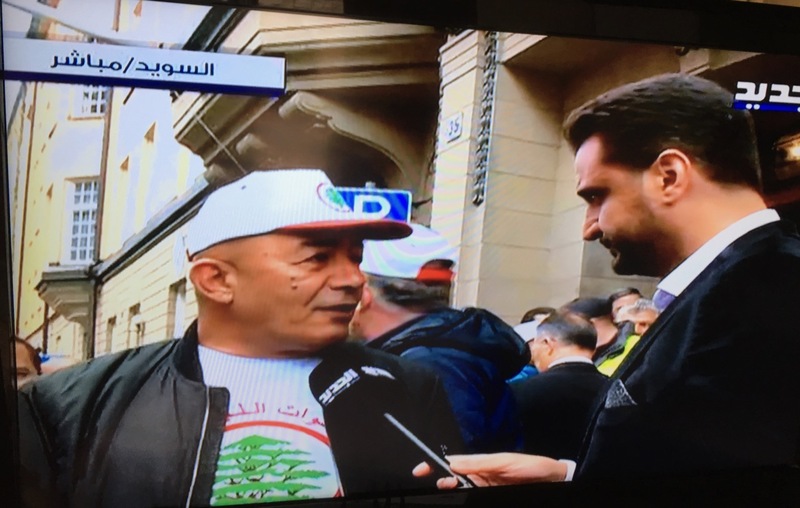 It’s no wonder considering some activists interviewed by the channel have been freely attacking senior Lebanese politicians, including Speaker Berri, over the state of corruption and chaos in the country. But there is no footage of the fist fights and rock throwing of these men. 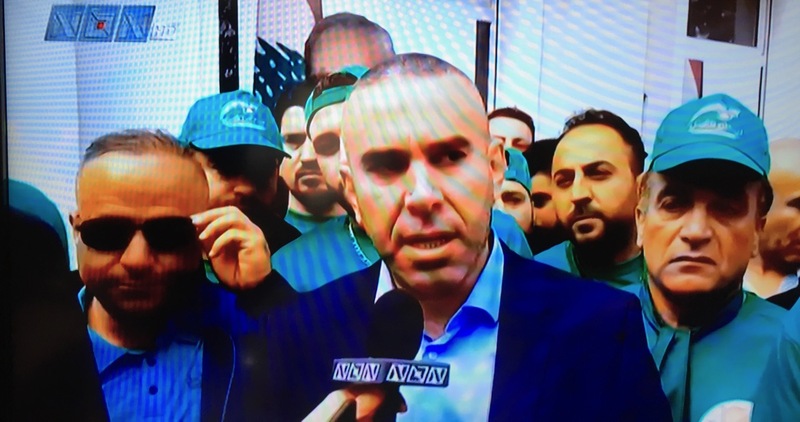 “The police intervened and restored the situation to normal,” the NBN anchor reads nonchalantly from the teleprompter, no mention of the launching of projectiles that could have easily sent many to the hospital or worse. Yet in reality, as noted earlier, the riot police waited several minutes before intervening. 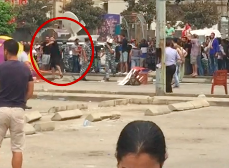 Even though there were dozens of riot police in full gear standing only a few meters away, they barely budge as civilians are being beaten and targeted by concrete blocks being thrown by the mysterious men. Many began to ask: why did they police wait around so long? Earlier in the day, police did not hesitate to rough up protestors and arrest some 40, many activist organizers with no justification. Most were released a few hours later. One, activist Aly Sleem, told me police had shoved him in a van, pushed his face into the floor and began threatening him with military prison or being sent to Syria. They drove him around in circles for two hours, claiming he had received foreign funding and had attacked police, both of which had no basis. Were the men who attacked the activists also abducted, driven around and threatened by police or did they get off easier? The story doesn’t end there. 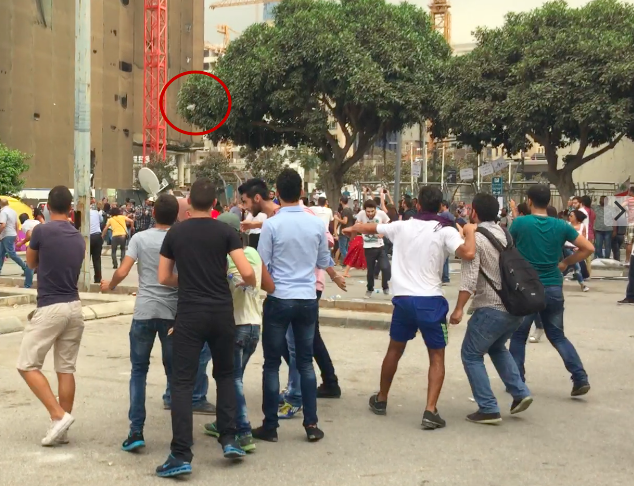 Four days later on Sept. 20, a group of some of the same men once again violently assaulted the protestors. 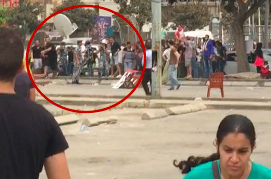 Within minutes of raising the banner, two men run up to the activist. 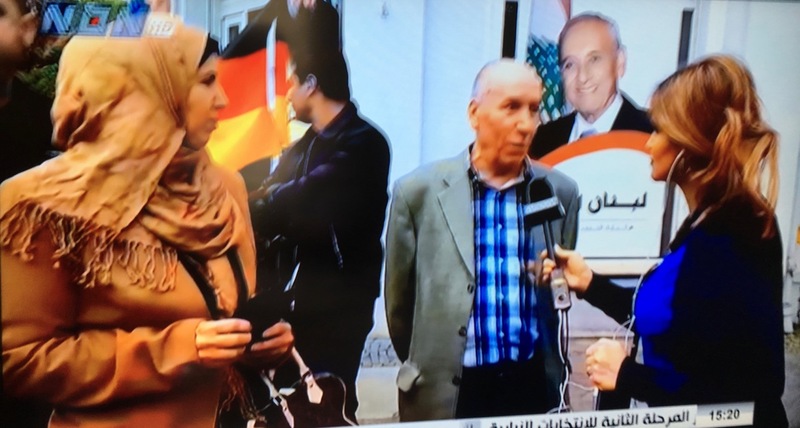 One says “Don’t you ever raise Nasrallah’s photo!” Ironically the activist was praising Nasrallah in comparison to other politicians. And yet he was hauled away as other partisan men began to fight those protestors who tried to intervene. I ended this clip when one of the violent men wearing a black shirt and black hat is seen roaring wildly at those around him, sending many running. He then spots myself and a few other cameraman and begins lunging toward us. I put my phone down and then watched him walk passed me and punch, throw against a wall and then kick and beat two cameramen to the ground. 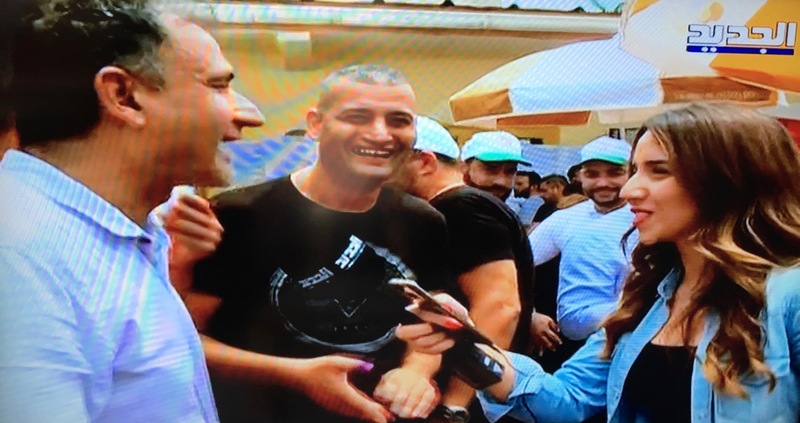 Suffice to say, there was very little filming after that, but thanks to the drone footage by Al Jadeed, we can see the rest of the fight continued in the clip below. Eventually the activist is dragged by his neck, his clothes ripped off and then beaten repeatedly by hand; then beaten repeatedly over the head with the megaphone he was holding. Later in the video above, we can see the violent men fall into a march formation, their numbers grow to about 30 as some join from the crowd. 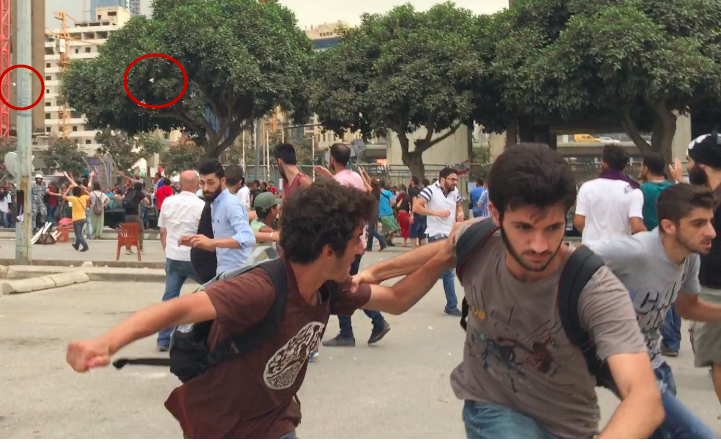 I notice several familiar faces from the previous attack at the environment ministry, including the man who kept throwing rocks at protestors despite the police presence. I watched as the men would stand around separately as if they didn’t know each other, circulate and then eventually join up together. Once again, the riot police stand idly as the men pass defiantly in front of them. Thus the vulgar language, the rage in their eyes, and the willingness to commit fatal acts of violence seemed to be very similar tactics. The men appeared to be part of a group, trained in how to operate discreetly in a crowd: fall into formation in a moment’s notice and then disperse back again and melt into anonymity. There appear to be clear roles and objectives as only a few of the men engage in acts of violence while others weave through the crowd or stand close to the action without getting directly involved, seemingly to provide back up. 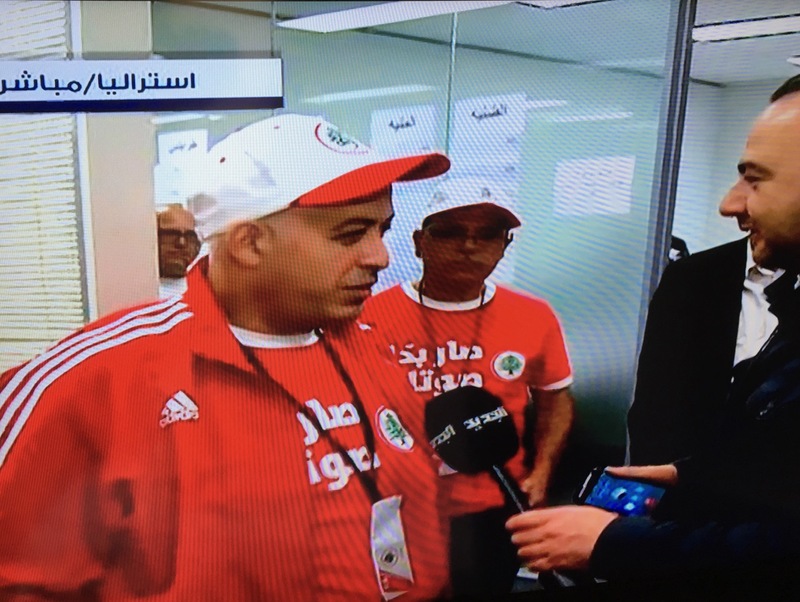 There is often what appears to be a ring leader in his 40s/50s keeping the men in line, seen at the end of the Al Jadeed drone clip. Are we to believe these men gathered spontaneously? That they are a random sample of friends or neighbors? And what about NBN TV and Amal’s version of events where no violence happens and the party has nothing do with the men attacking protestors? Yet why are only two men investigated? What about the many others who were throwing punches or rocks at the crowd? And what about the role of the police? Were they genuinely intimidated by these mystery men? How could the police take on thousands of peaceful protestors, arresting, tear-gassing and assualting dozens over recent weeks, and yet barely lift a finger to stop less than 10 or 20 men? Many were left wondering: which side are the police on? Once again, who are these men? If Amal denies they are members, why are they so angry that someone cursed their leader or even simply called for his resignation? 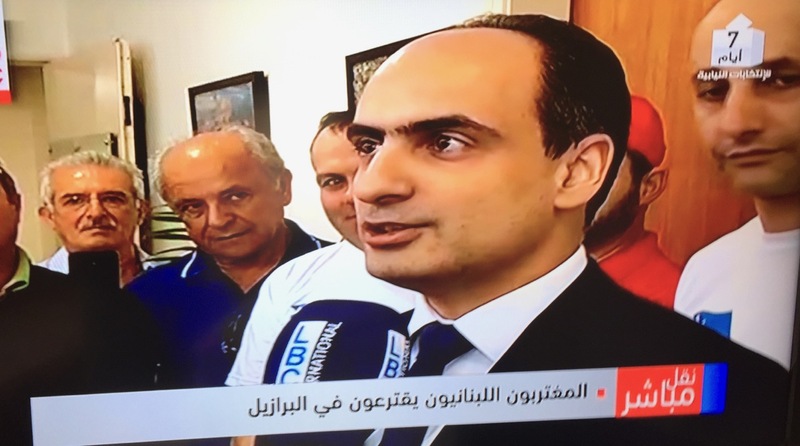 Could the men simply be average citizens who admire Speaker Berri? Then again, how many average men just sitting at home would feel they need to walk to a protest and physically harm as many people possible, with no ulterior incentive? 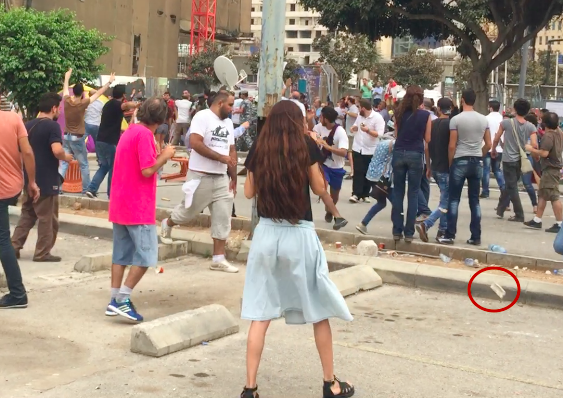 All this raises important questions about the future of the #youstink protest movement in Lebanon, which has undertaken several unprecedented acts of civil disobedience over recent weeks. But can leaders of political parties be questioned without retribution in violence? How many groups of men sitting at home today are willing to harm or even kill anyone who insults or even questions their leader? How will the protest movement deal with these individuals? What motivates their rage? Are they victims of the civil war themselves, suffering perhaps from PTSD? 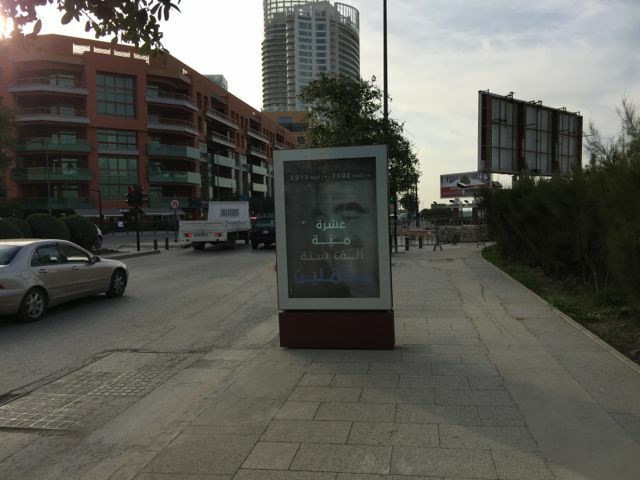 How can one reconcile with the reality that so many in Lebanon are still dealing with the war and or employed by its post-war political apparatus? What strategies of resistance to the state can activists take in Lebanon without inviting violence from party loyalists? Finally, will such violence and indiscriminate arrests by police dampen the protest movement? Or will more people be even more motivated to stand up for their right to speak out? After the police arrests and beatings by party loyalists on September 20th, later that evening thousands of non-violent activists still showed up. They defiantly filled the streets leading to parliament. They did not resort to violence, they simply sat on the floor and raised their hands until riot police finally relented. 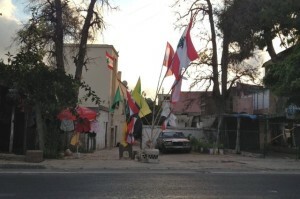 “From this point on, every square is owned by the people,” shouted activist Assaad Thebian over a megaphone, surrounded by a sea of protestors. The crowd roared. Then later sang patriotic songs and danced together. The feeling was electric that night. Now more than a week later, many will be watching what the movement does next and how it will cope with those violent individuals who do not want to see it succeed. 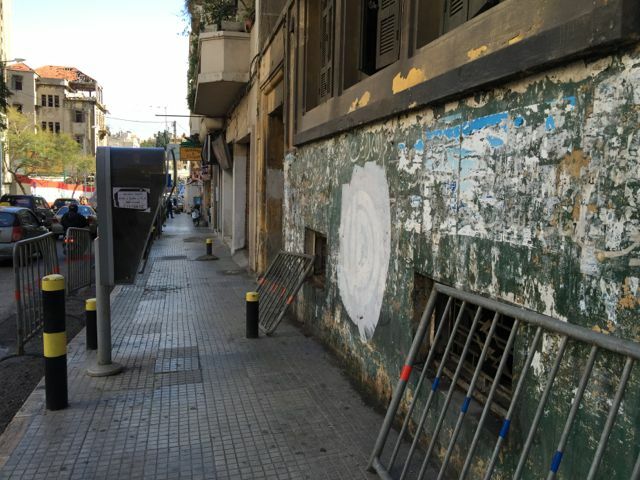 There has been much fanfare about the removal of political signs and posters from Beirut, as part of a reported reconciliation deal between the parties/militias/old men that run this country. I have to admit, I was surprised to see the decades-old Amal mural painted over on Spears Street. 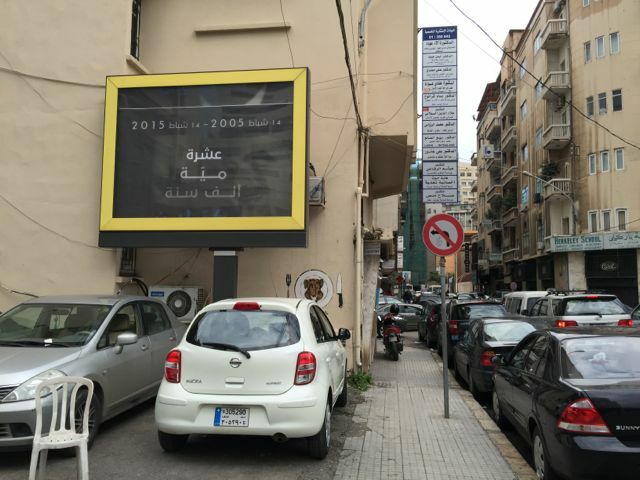 The Daily Star reported that Hezbollah had even removed posters of martyrs in Saida, though advertisements for the party’s museum remain up. 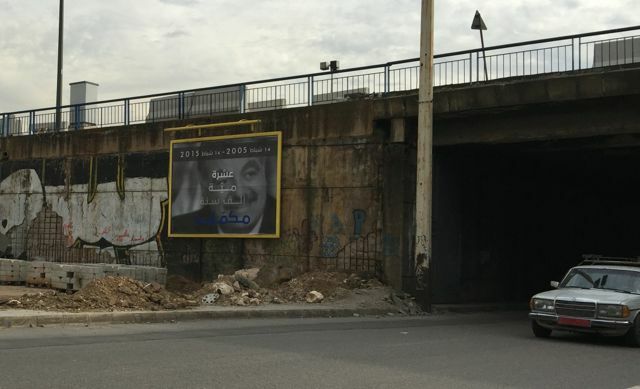 But what the Star didn’t report is that as posters came down for some groups, a massive billboard campaign went up commemorating the life of slain prime minister Rafik Hariri. 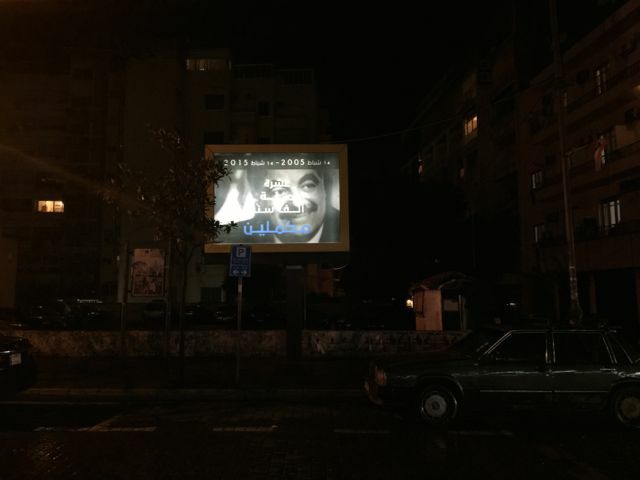 The billboards promoted a political rally for his party that would be held on the day of his assassination last week. 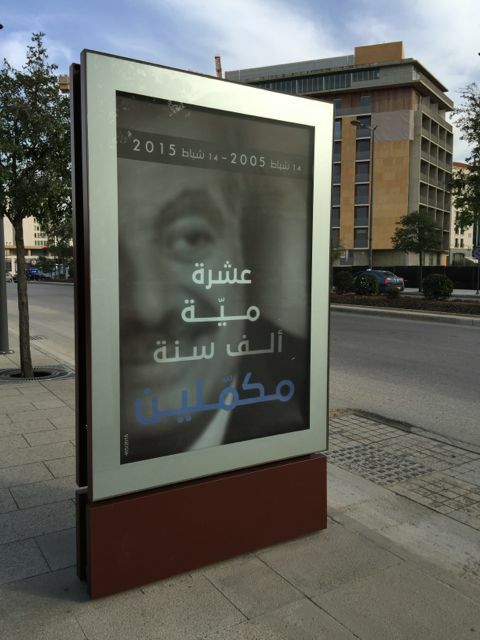 I wonder if this campaign was excluded from the reconciliation deal and why. 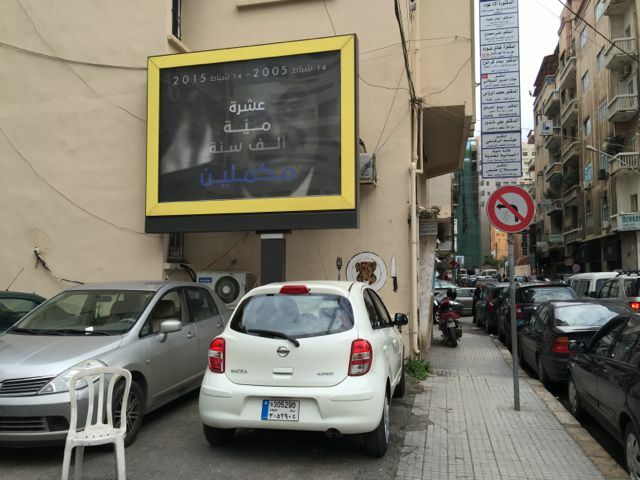 Look out for my column next month in Bold Magazine for more on Beirut’s history with political posters, how the latest crackdown compares to previous removal campaigns and what is often left out of the process. 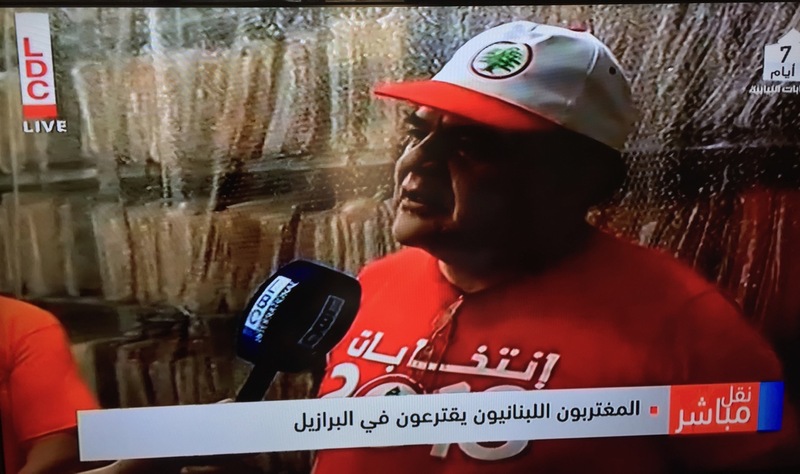 More seriously, Sadr was the founder of the Amal movement and didn’t live to see its integration, like the Lebanese Forces, from militia to political party. That his image is used in contemporary capture-the-flag politics belies his inclusive, self-empowering legacy. For more on Sadr’s facinating life and little-known tension with the Iranian leadership, I highly recommend Shaery-Eisenlohr’s book. 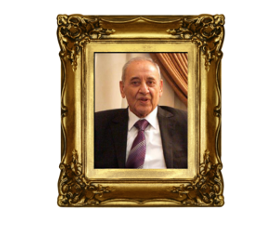 Nabih Berri has been speaker of Lebanon’s parliament for over 20 years. Finally, he’s getting some recognition. 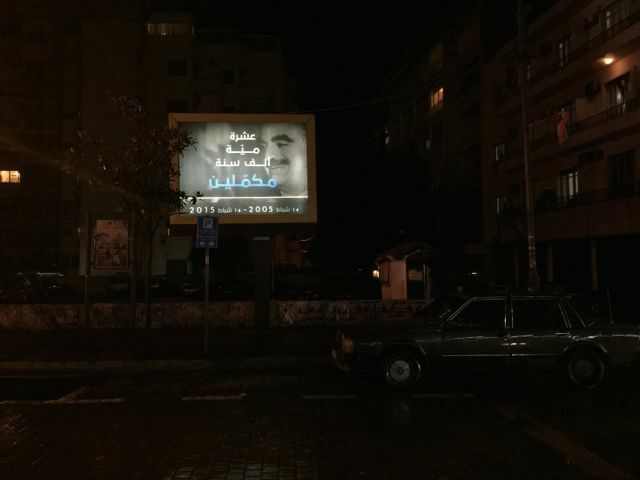 The folks at Take Back Parliament have put together the website “Nabih Berri Forever” to elect the former militia leader to the Guinness Book of World Records. They have apparently actually submitted the application. The site also has this neat, real-time count-down clock— or should I say count-up? 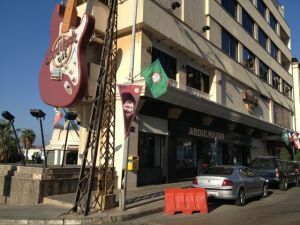 Unlike the fierce battles over biggest hummus or tabouli plate, Lebanon may have this one in the bag simply because there are so few remaining Arab leaders with decades-long careers to compete. 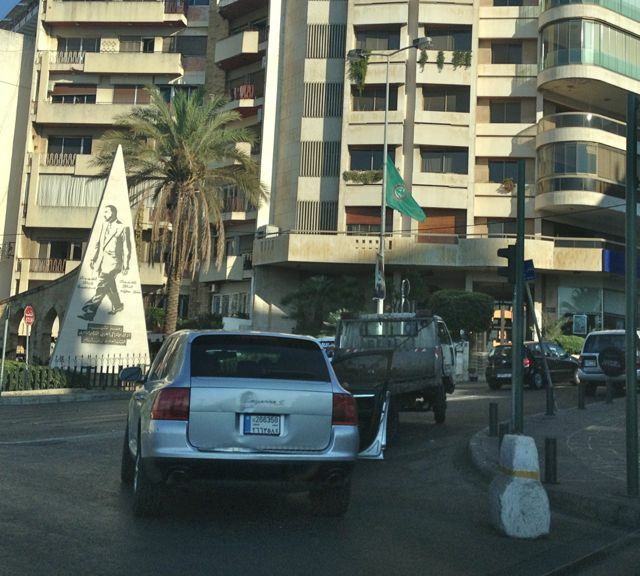 In fact Berri rose to power well before he took office in 1992. He had become the leader of Amal–one of the most powerful militias during the civil war, in 1980. I’m pretty sure he still maintains that position today as well. 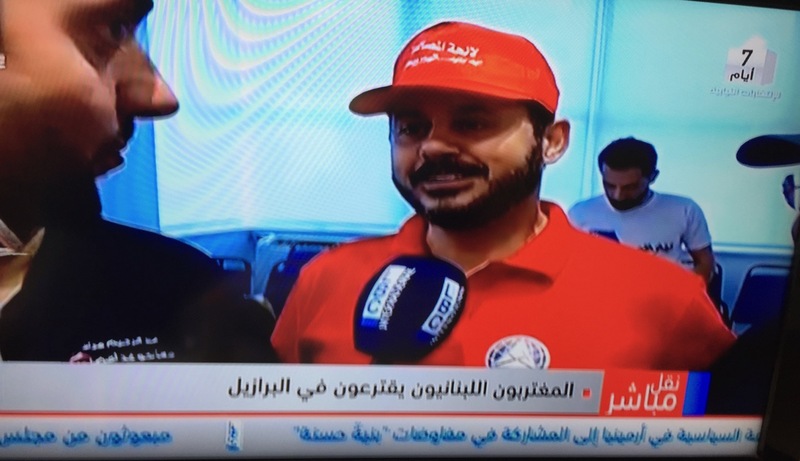 Laughter and cynicism aside, one question a lot Lebanese may be asking is: Are there no term limits within political parties or within the national Parliament? Perhaps those leading this campaign can eventually channel its energy into a national conversation on term limits and their implications. Around 12:30 PM today while trying to get some work done, I heard a cacophony of honking that went on for longer than the typical irate taxi driver. 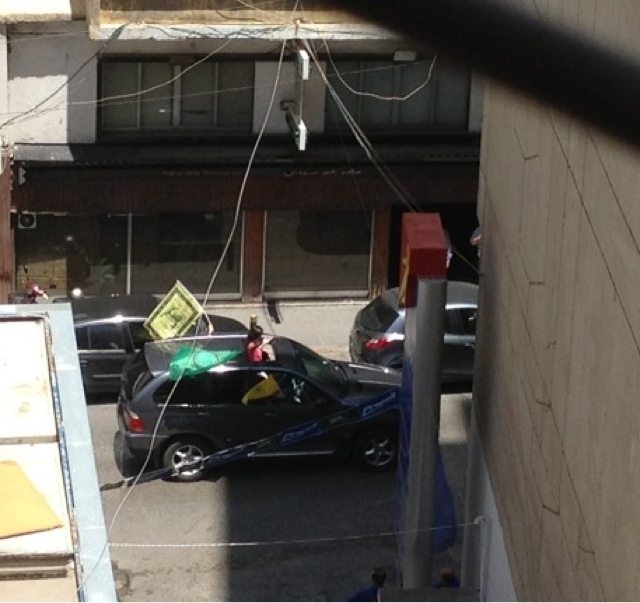 Finally I had to have a look out the window, and when I did, over a dozen cars were streaming through Hamra waiving Hezbollah, Amal and Syrian flags. The honking was similar to a wedding celebration. 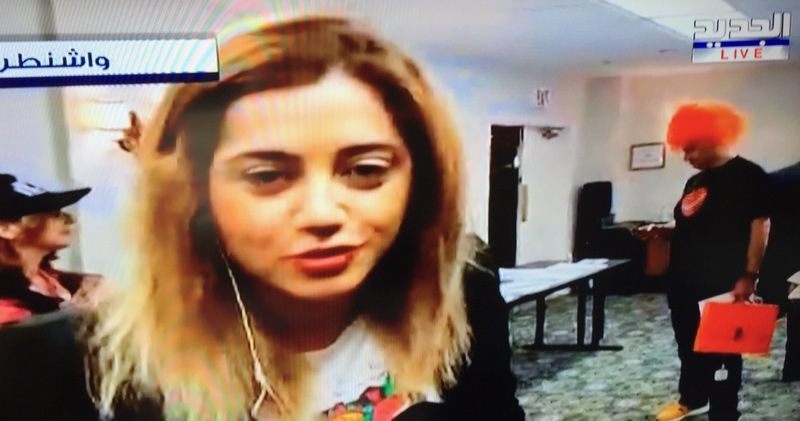 It seems to be related to the ongoing battle in Qusair, Syria, and Lebanon’s inevitable involvement, which I spoke about yesterday on the BBC World Service. My commentary begins at 17:00. This also proves that when you sit down to write something in Beirut, a distraction is always a moment away. 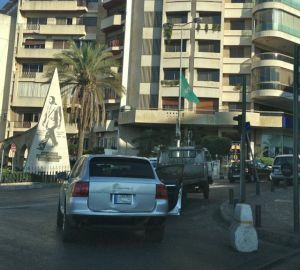 The Army had blocked off all roads leading to Salim Slem this afternoon, following clashes after a rally by supporters of the Salfist preacher Ahmed Al Assir. 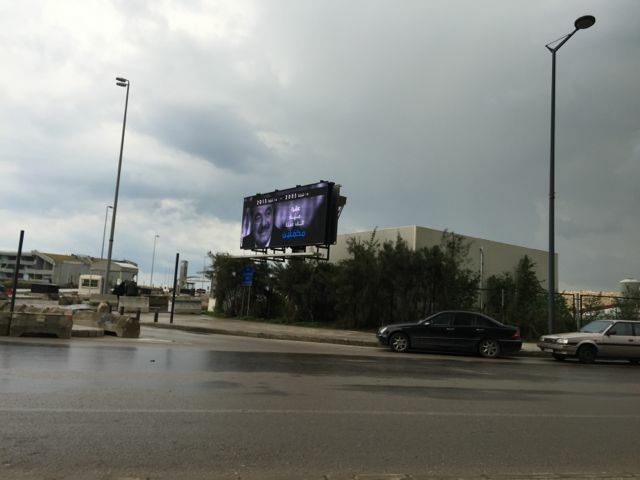 The Salim Slem corridor (above photo) is the main thoroughfare to the southern coastal highway, which leads to the airport and ultimately to Saida, where Al Assir lives. 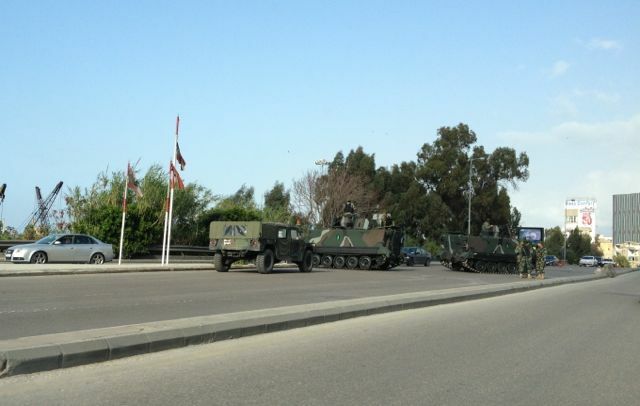 Nahrnet reported that a checkpoint had been set up by Amal to cut off the Assir men. 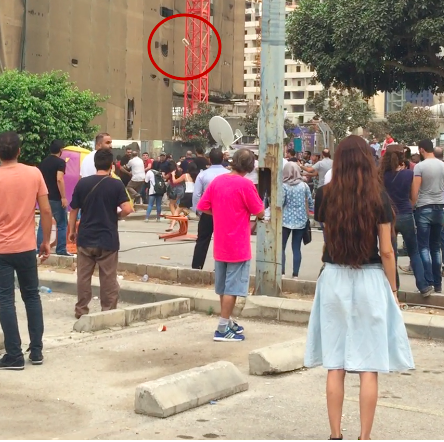 If so, was it related to last night’s sound grenade reportedly thrown at an Amal office and subsequent gun fire exchange? One can only speculate. Additionally, about an hour earlier that afternoon, Assir supporters had paraded through the streets on scooters. 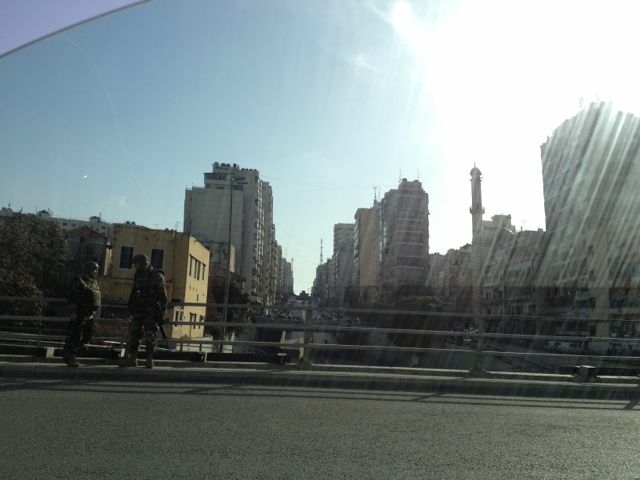 They had attempted to enter West Beirut but were turned around by army troops and forced to hit the corniche instead, tooting and flag waiving all the way. The army reacted quickly following the clashes later in Salim Slem, deploying APCs and troops at several intersections in the surrounding area. 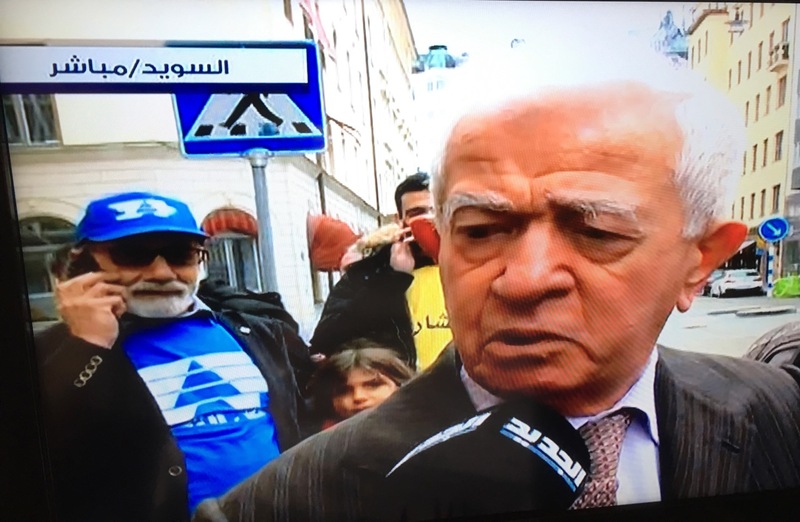 This is not the first time Assir supporters have run into trouble in Salim Slem. I saw a stretcher being carried out across the street just before I snapped this shot. 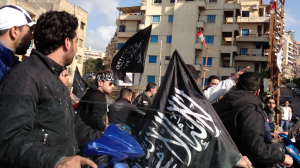 It seems a possible solution to these Salim Slem clashes would be creating an alternate route into the city for Assir supporters coming from Saida– one that does not pass by territory of rivals that can easily be blocked. 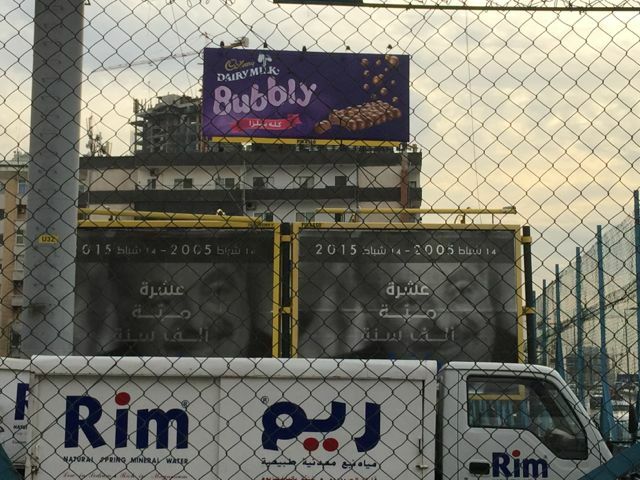 A picture can tell a thousand words and this one is all too Lebanese. 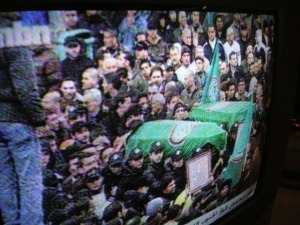 Where else in the world are caskets routinely draped in the flags of political parties? The two coffins pictured above (courtesy Lebanese TV channel NBN) carry the flags of Amal, which is part of a coalition of political movements that reject the US-backed Lebanese government. Like so many funerals of recent years, this one has evolved into an angry rally with heated calls for revenge. 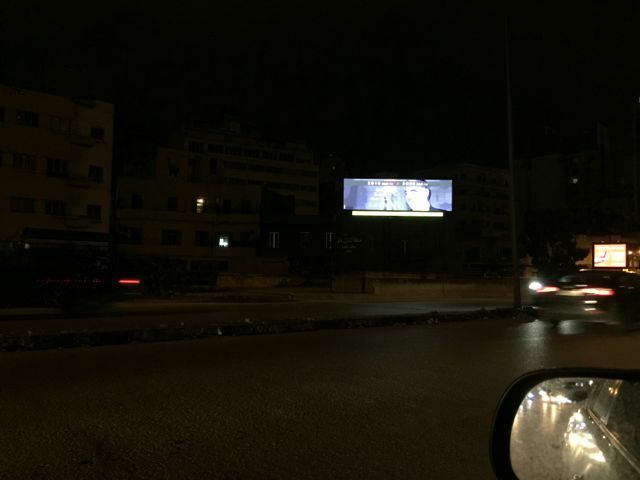 It follows the killing of at least 7 Lebanese citizens after a bloody Sunday afternoon marked by violent riots against the government and sporadic shooting of the protestors. 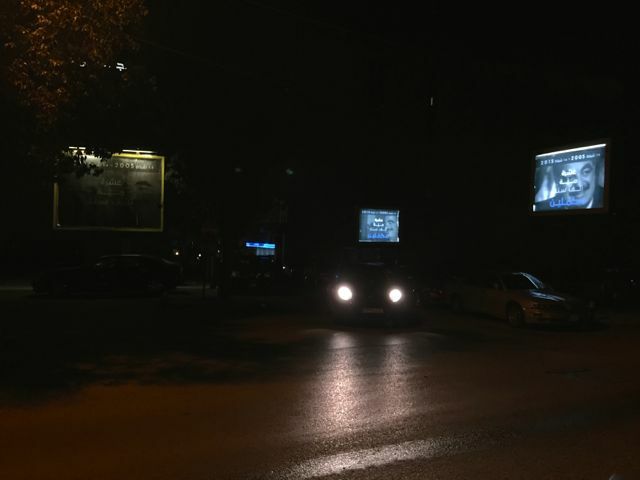 It is not exactly clear who did the shooting yet, but on the streets and in the press, a pro-government party is already being implicated. Meanwhile, a third funeral procession in another part of the country mourned the loss of a man employed by the “Civil Defense,” a government institution, similar to a fire department. His coffin was draped in a Lebanese flag. 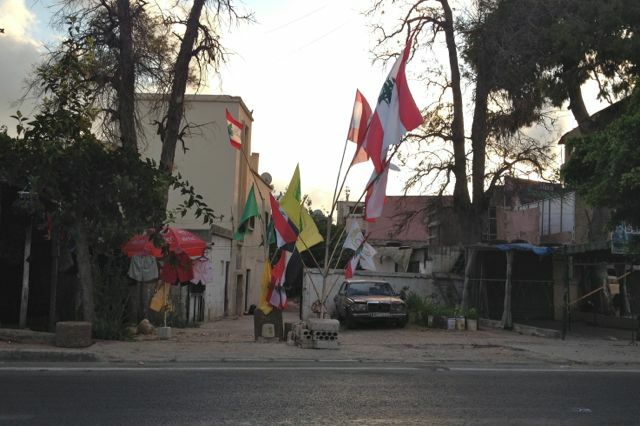 One day, three angry funerals, three separate flags. Does this sound like the democracy George Bush refers to when he speaks so fondly of his support for “the Lebanese people”? And its not just three flags. There are dozens of political parties (i.e. 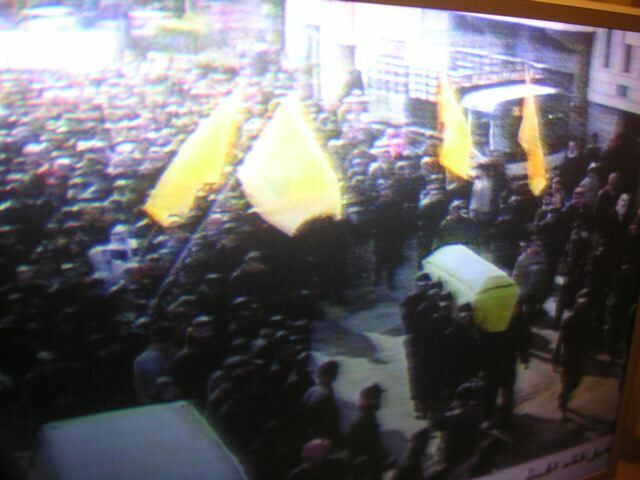 sub-states) in Lebanon, and many on the pro-Western side have held similar rallies at funerals, shouting allegiance to individual leaders rather than the nation as a whole. 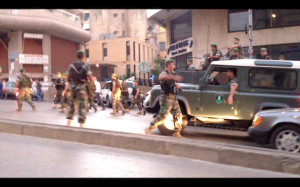 As the US gets ever more involved in Lebanon, the American people should realize that this is a deeply divided and complicated place. Like Iraq, Palestine and elsewhere, Lebanon will not simply succumb to the brush strokes of US foreign policy and a very convenient definition of “freedom”.